Dallas TechFest is tomorrow! 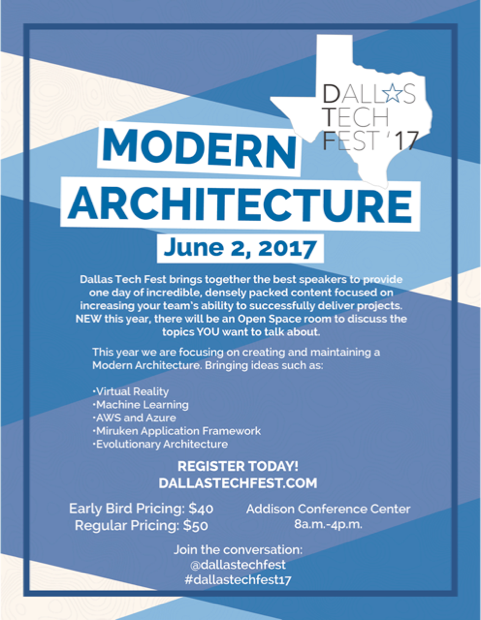 There is still time to register and get excellent content focused on Modern Architecture, virtual reality and AWS and Azure (http://dallastechfest.com). Plus, an Open Space room to discuss the burning issues YOU want to talk about. Ticket pricing includes full conference, light breakfast and a food truck lunch. It’s the last day of 2015, and it seems only appropriate to tie up loose ends with a short post about our year. I continue to be amazed by the energy and dedication of our community. Our membership grows each week and attendance is strong at our meetups. Some folks thought I was nuts for holding a December meeting, and you all showed that it was worth it! I am extremely happy that we were able to have Nirmal Malhotra in November and Mike Rieser in December to provide us great content and learning during the holiday season. Thank you for a great 2015, and I look forward to seeing you the third Tuesday of the month in 2016! 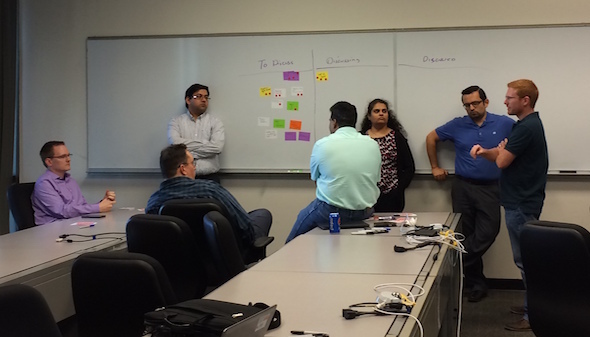 As more teams are adopting Scrum around Dallas, I’ve been hearing more questions about how to handle work that is not specifically requested by the Product Owner. How do you handle production support issues in Scrum? How about technical debt? How do you plan time for research? How do you manage defects? According to the Scrum Guide, “the Product Backlog lists all features, functions, requirements, enhancements, and fixes that constitute the changes to be made to the product in future releases,” but what does that look like in execution? I had a great time and learned some valuable insights from fellow scrummers. Best experience [at the meetup]. Gained lot of insight. Great breakout sessions and helpful recommendations. Allison, thank you for facilitating. Thank you to everyone who attended and made it a rich evening of learning!